NBA Jersey Sponsorship — Who Should Sign on the Dotted Line? Last week the NBA Board of Governors announced it is to start allowing NBA teams to sell advertising space on their jerseys for the first time. This hugely debated decision amongst fans and commentators will make the NBA the first of the four big US sports to allow on jersey brand sponsorship. Surprisingly, the National Football League (NFL), Major League Baseball (MLB) and National Hockey League (NHL) do not allow team sponsor logos on player’s jerseys. Sponsorship opportunities in the top tier of basketball are eye wateringly big – just last year the NBA signed a $1bn sponsorship deal with Nike that places the Nike’s “swoosh” logo on the right shoulder of all the NBA team’s shirts. Under this pilot-programme each of the 30 NBA teams will be responsible for signing their own deals with sponsors for the new 2.5in (6.3cm) square space. As soon as the news was announced, we got to work analysing social media conversation surrounding two of the biggest teams in the NBA; Golden State Warriors and the Cleveland Cavaliers, and the player of the moment — Stephen Curry. If you’re not aware, Stephen Curry is a 27-year-old Golden State Warriors point guard who is already being named the greatest shooter in NBA history. Essentially, he could be Michael Jordan level of good. Using our newest tool ‘Constellation — Brand Version’ we set out to identify the most relevant sponsorship brands based on the teams and players target audience interests and affinities. As shown below the top three talked about brand categories for the Warriors’ were Consumer Tech (12%), Retail Food (12%) and Retail (11%). As for the brands themselves, in the most talked about category of Consumer Technology, Apple took the top spot with a 17% share of the conversation, followed by Dell (13%) and PlayStation and Samsung (both with 11%). In Retail Food the most talked about brands from the Warriors’ audience were Taco Bell (13%), followed by Starbucks (12%) and Subway (11%). In the Retail category it was sportswear retail giant, Footlocker who took the top spot with a 20% share of the conversation. As the overall most talked about brand by the Warriors’ target audience and already one of the largest suppliers of NBA Jerseys, this would a fantastic sponsorship opportunity for the brand. In second and third place were Walmart (13%) and existing NBA stadium sponsor Target (7%). Based on our audience insights our first pick for the Warrior’s would be Footlocker. With fans of the team already talking about Footlocker in high numbers online, and the fact they are an established retailer of NBA jerseys we’d expect Footlocker to benefit greatly from signing a deal with the Golden State Warriors. Heading from the Western Conference to the East, the Cleveland Cavaliers audience tells a similar story. As shown below the top three brand categories were Consumer Tech (12%), Retail Food (12%), and Sportswear (12%). We can see in the graph below the most talked about Consumer Tech brands were Apple with a 15% share of the conversation, PlayStation (12%) and Dell and Samsung (both with 11%). In terms of Sportswear brands, with Nike, Adidas and Under Armour received the highest levels of conversation. Based on our research our first pick for the Cleveland Cavaliers would be Nike. With the sporting giant already receiving a large share of conversation from the Cavalier’s fans, the fact they enjoying a very successful season so far, and as they are already reaping the benefits of their existing deal with the NBA, we expect Nike to look to further their involvement with the league. So will we be seeing a West Coast v East Coast contest to which brands snap up their favourite team? Only time will tell…. With the new sponsorship deals expected to be taking place over the coming months, there will concerns for teams and players in how they approach sponsorship deals which may conflict with existing sponsorship agreements. For example, a player like Stephen Curry who is endorsed by Under Armour may not be so accommodating to have a larger Nike or Adidas logo on his shirt. 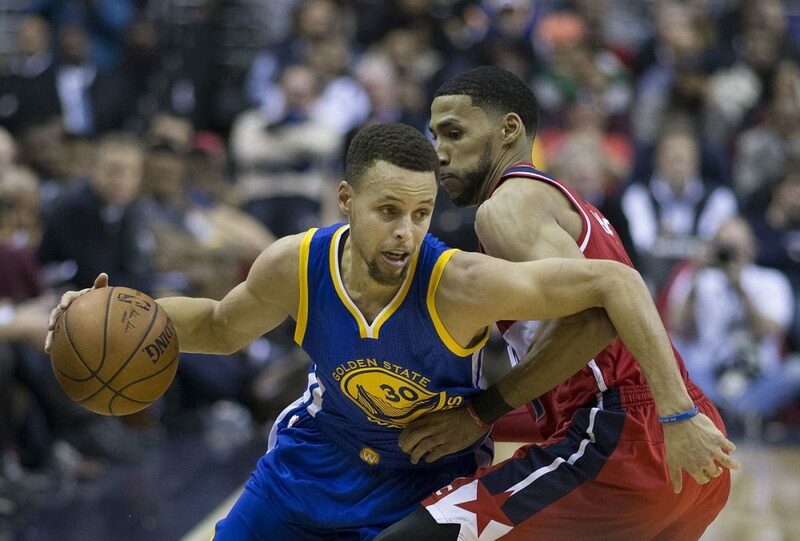 As we delved deep into the conversation surrounding Stephen Curry it was clear the results were going to provide some interest topics relating to a recent sponsorship deal involving Nike, Under Armour and Curry. In 2013 Nike failed to keep Curry on their roster. This was, apparently, due to a business pitch from hell where a Nike executive mispronounced Curry’s name and had a different players name in the presentation. At the time the deal was worth four million dollars, an opportunity which Under Armour will be enjoying for years to come. Our research shows that the most talked about brand categories for Stephen Curry fans were Consumer Tech, Retail and Retail Food. Looking at the brands themselves the online audience of Stephen Curry were talking about Apple, Dell and PlayStation in Consumer Tech,Footlocker, Walmart and Target in Retail and Taco Bell, Starbuck and Subway in the Retail Food category. It is also worth noting that Nike are talked about by the audience of Stephen Curry more than existing sponsor Under Armour. We’re sure this only adds salt to Nike’s wounds as they are now in a position where they can’t fully utilise this highly engaged audience. Over the coming weeks, we expect to see much more online conversation surrounding the NBA and potential sponsorship deals. We’ll be keeping a close eye on this as it develops. If you're interested in learning more about the Audience Intelligence solutions we offer here at EntSight then take a look at our website to find out more or drop us a message..